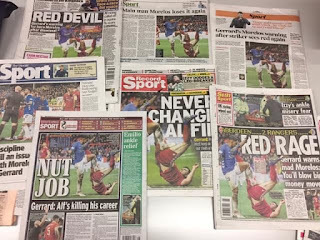 This astonishing photo shows just how badly the Scottish media have it in for Alfredo Morelos, how despite Scott McKenna’s infinitely worse offence, it’s the Colombian that has completely dominated the headlines this morning. We have no more to add to this. And BBC,s Michael Stewart and Stephen Thomson were a disgrace. Their anti Rangers bias was an embarrassment. On the McKenna / Morelos incident they made no mention of McKenna initiating all this by holding on to Morelos,s jersey. They said Rangers were offside at penalty. Wrong. McGregor red card. Never. He had the ball. Foot up protecting himself. Ferguson should have pulled out. And Ferguson’s foul on McGregor. Straight red. Quite deliberate. Love it. No one likes us we don't care. To be honest, if a player kicked me in the nuts like that I would volley them into next week. Alfredo needs to screw the nut, he's a cracking wee player but these types of incidents seem par for the course with him. Who gives a f....We won...We move on! Watched the highlights program last night. Whilst the Morelos incident got replayed over and over, there was not one single replay of Simonovic for Celtic nearly elbowing a Hibs players head of his shoulders forcing him off injured. Far worse than Morelos by a long way as it was unprovoked and just dirty..Not to mention Burke trying to con the ref with a terrible dive at the end. Expected though.. According to a BBC reporter Scott Brown was booked when he should probably have been sent off. Not even shown, never mind discussed, on Sportscene. While they did show and discuss the booking of a Hibs player for the tackle that led to Izaguirre coming off. The dive WH is referring to is doing the rounds on social media and is one of the funniest, worst and most pathetic and embarrassing dives Ive ever seen but again wasn't shown on Sportscene. 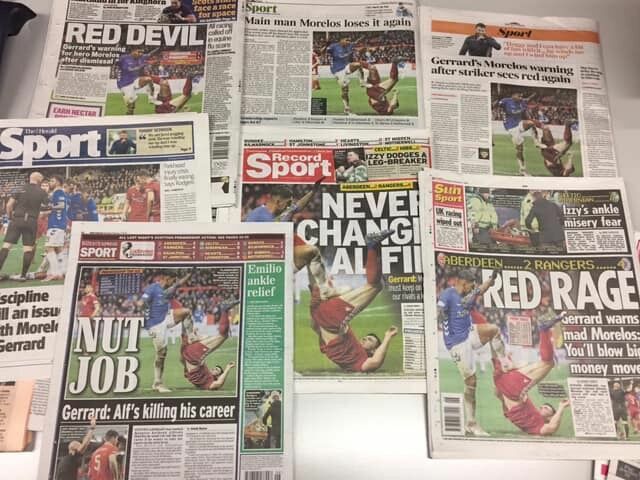 Morelos` previous record and incidents were always going to mean he was the headline and to be fair he makes it easy for them .He was stupid to get involved again when he was winning the battle hands down .Don`t see the fuss about the McGregor one , he slid out to scoop up the ball , feet first as he keepers do and he wasn`t even looking at Ferguson when he caught him .How can that be deliberate? What I find hard to believe, is the fact that they'll stand there and have the 'HARD NECK' to try and deny it. They've been 'made' so many times. Caught out! Glasgow green media, we have a message for you. DENIAL, is futile!! The trouble with Morelos is Morelos a really good player in the making, but let's not kid ourselves he got away with it against Celtic (stamping) and he does it last night, what ever the opposition player was doing to him he has to cut this kind of action out ,to me he took the shine of a great win last night. We need our best players on the park not sitting in the stand which could cost us dearly for the remaining of the season.